There are several types of PCOS on what I like to call “the PCOS spectrum” and these types fall under three banners – synthetic-hormone induced PCOS, insulin-resistant PCOS, and inflammation-based PCOS. While there are specific treatment protocols I advise for each type, there are still crossovers between, and certain supplements benefit every woman suffering with PCOS.I’ve had my own PCOS in remission for some 20 years using my FLO Living protocol. Food is the foundation of this protocol, but supplements super-charge the benefits of those hormone-supportive foods. I personally had a combination of the PCOS types mentioned above and I was able to roll back the symptoms and regain my health and fertility with the Cycle Syncing lifestyle. Micki and Judith are just two of the thousands of women I’ve helped reverse their own PCOS since teaching the FLO Living protocol to women. 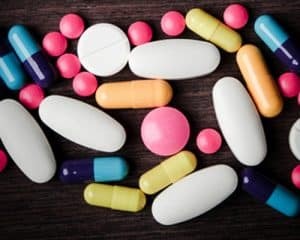 In previous posts I’ve explained in detail why the two most commonly prescribed PCOS treatments you are most likely to be offered – that is, Metformin and the birth control pill – are not actually effective and moreso “band-aid” solutions that sidestep the root cause and don’t tackle the issue long-term. Briefly, Metformin is only right for women with insulin-resistant PCOS, and even for these women I still recommend only short term use of the drug, and always paired with proactive changes to diet and lifestyle. The birth control pill masks the problems associated with PCOS. It may suppress some of the symptoms short term, but they usually come back once you go off and can be exacerbated by compounded hormonal imbalance. The pill exacerbates many of the root causes of PCOS, including insulin-resistance and inflammation. These 5 supplements will be beneficial to all women with PCOS, addressing the root causes of this common hormonal health issue. Cinnamon – taking this warming spice as a supplement is proven to stabilize blood sugar, which is essential for all hormonally-sensitive women, but especially those with PCOS. I recommend New Chapter for a cinnamon supplement, but you can additionally shake cinnamon on oatmeal, eggs, or enjoy cinnamon tea, like Tazo’s Cinnamon Apple Baked. Getting blood sugar balance under control is so important for moving beyond PCOS. Magnesium – most women are deficient in magnesium and magnesium is vital for hormonal balance. Magnesium is proven to improve insulin resistance, it’s anti-inflammatory, and it redresses adrenal hormones – all essential actions for managing PCOS symptoms and treating the root causes of PCOS. B6 – one root cause of PCOS is estrogen dominance, which is inextricably linked to progesterone deficiency. B6 is proven to increase progesterone production and is actually one of the best vitamins to boost this hormone. You can do this with B6 rich foods like bananas, grass-fed beef, and garlic, but you can also take a daily supplement. Selenium – this nutrient is essential for your liver, helping to detox excess estrogen and environmental estrogens like pesticides. It also boosts progesterone along with B6, supporting the development of the corpus luteum which creates all your body’s progesterone. As such, selenium is a double whammy for tackling the root causes of PCOS. Zinc – this mineral balances testosterone. Whether your testosterone levels are high or low (both possible with PCOS), zinc will have a positive affect. Several studies have shown how beneficial zinc supplementation can be for women suffering with PCOS, with relatively rapid results. How much of the supplements should women be taking? I would take the recommended dose suggested on the bottle unless you have been told otherwise after a consult with an MD or with one of my counselors! what form of magnesium is best? a mag glyceinate chelate? orotate? What about d-chiro and myo inositol? I see those two everywhere for PCOS treatment, but couldn’t find anything about it on Flo Living. Wondering what your opinion is? Thanks so much for this. I’m currently experiencing my first miscarriage. My progesterone levels were very low. Should I treat the miscarriage as being in the menstrual phase? How do I know when I’ve started back into the follicular stage? I am so sorry for your loss. Yes, treat the miscarriage as luteal, give this phase 2 weeks and then start to cycle back through that phases at the correct intervals. Once you get your period again, match your diet to where you are in your cycle. Thanks. I am 13 months postpartum and still breastfeeding with no period. The breastfeeding hormones are suppressing ovulation. How do I cycle sync, or do I have to place that on hold until my period returns? What do you recommend for women who are breastfeeding and not having periods, but want to be in touch with their hormones? I am 11 months postpartum and still producing milk, though significantly less than I had been. Still no period. I had my levels checked recently, and my estrogen and progesterone are abysmally low. I, too, am looking into supplementing to improve those and might even consider quitting breastfeed, which my midwife said is the likely cause of these low levels (note: she’s not discouraging me from breastfeeding). No advice here, but I am in the same boat. *I should also add to my last comment that I am 13 months postpartum and this miscarriage was from catching the first egg. Are there specific milligrams of each that should be taken? Additionally, should I take ONLY B6, or is a B-Complex okay? I was wondering if I should take the supplements just for a short period of time, or to make it a permanent habit? The supplements should be taken throughout the healing process. You may find that you need fewer of them once you are back on track! Do make sure that you are following up with food and lifestyle, as the supplements won’t do the whole job for you! Thank you so much for your great articles. I have been diagnosed with PCOS with high testosterone level, and the different specialists I have seen had been quite confused with the effet of zinc on this hormone. I would like to take it for my skin, and eventually regulate my testosterone level, but I am scared that it will increase my unwanted hair growth. I would love your advise on that – which would be more thank helpful. Thank you in advance for your great help. How much of the zinc is okay to take a day ? I have the 50mg from Finest Nutrition.